The Florida based Beta Analytic carbon dating laboratory report yesterday revealed that the six bone samples collected from Mannar Mass grave falls within the 1499 – 1719 period. Mannar Magistrate T. Sarvanarajah ordered to make the report public, when the case was taken up following a motion filed by the relatives of missing persons in Mannar yesterday. Consultant JMO Dr. Saminda Rajapaksa who supervised the excavations at the mass grave said the report on the samples of bones sent to the Beta Analytic has been officially received by Court. The report was about six samples of bones obtained from the mass grave. Although the Magistrate Court officially received the relevant scientific report from the Florida Beta Analyst Laboratories, the court had also requested an official description about the relevant data from the company. Dr. Rajapaksa said Florida laboratories has been requested to submit the date of the investigation report in writing to the Mannar Magistrates Court. Bone parts of 325 persons including 29 children have been found from the grave site. Six samples of bones found at the site were referred to the Florida based Beta Analytic Institution for radio carbon dating report on January 23. The samples were taken in the presence of a team of Judicial Medical Officers, senior professor of Archaeology Prof. Raj Somadeva, officials attached to the Office of Missing Persons, the Government Analyst and relatives of missing persons to ensure transparency on the order issued by the Magistrate’s order. The excavation in this place began on the orders of Mannar Magistrate A. G. Alexraja in March last year and investigations have been continuing under the close supervision of experts in Judicial Medicine, Archaeology with the assistance of Government Analyst. 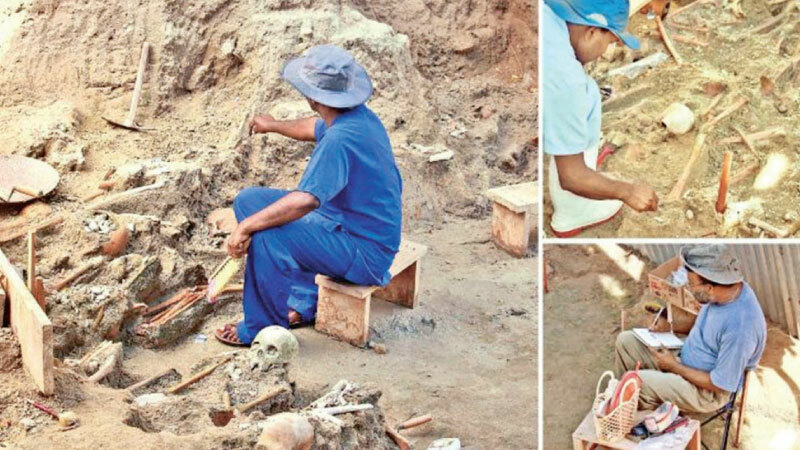 Professor of Archaeology, Kelaniya University said that the skeletal remains in many places have been placed in a formal manner and in some places they have been kept informally. Are they Sri Lankan Bones according to DNA?